Damascus steel rings are what happens when the skill of ancient masters meets the power of modern technology. The result is the Damascus steel rings at Titanium-Buzz. With unmatched form and mesmerizing designs descended from centuries of tradition, each of these Damascus mens wedding bands revive the best of a lost art, right on your fingertips. Intermix steel with gold for a one-of-a-kind experience, or go epic with a blend of steel and titanium. Here, all roads lead to adventure and all journeys lead to a new way to experience jewelry. 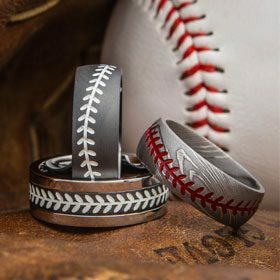 Whether you're looking for Damascus steel wedding ring that shows your love for the hunt or want something that celebrates your sporty sense of style, you'll find it here at Titanium-Buzz. We love Damascus steel wedding bands so much that we've created an impressive array of unique styles of Damascus steel rings. Let your Damascus ring say something about your bold personality. Add a subtler feel when you pick a Damascus steel ring with a one-of-a-kind inlay. Down-to-earth spotted tamarind wood meets luxurious 14-karat gold inlays in this selection. Guys who want to add a pop of color will appreciate our styles with copper, rose gold, or titanium accents. Love rare stones? Check out our out-of-the-box Acid Finish Damascus Ring, which features a black diamond and a rose gold bar. Why was Damascus steel considered a lost art? Damascus steel jewelry and weapons were in production as far back as 2,400 years ago. Although named for the region that is now the capital of Syria, classic Damascus steel was made from Wootz steel, which was perfected in and imported from India. Remember, Damascus steel is the result of a metalworking technique, not the metal itself. An early global commodity, Damascened Wootz steel was highly sought around the world and was in global production through the 1750s before mysteriously disappearing from the world stage. Theories abound as to why the art was lost. Some sources argue that a depletion of the ores used to manufacture Wootz steel was to blame. Others point to the breakdown of trade routes, while others argue that the technique was kept "too secret" and was not passed on to enough metalsmiths to survive. Some blame British colonial rule in India for suppressing the technique, while still others claim it was a combination of all these factors. A few metalworking historians even argue that the art of Damascus steel wasn't lost at all, but instead quietly evolved into different, more modern processes. Modern Damascus steel, which attempts to replicate the ancient art through reverse engineering, was only introduced in the past century. Although the finished products look as fantastic as their historical counterparts, it is unlikely that the exact original process for making Damascus steel will ever be known. Damascus steel rings are the perfect alternative to traditional wedding bands. Damascus steel is more of a method than it is a metal. The rings are made by blending two materials together, resulting in a swirled surface that's unique to each ring. In fact, Damascus steel can be made from metals other than steel. The blending of the metals and the resulting design can be compared to the blending of two lives in a wedding ceremony, with a finished look that's as unique as your love. While the technique can vary, most Damascus steel products are based on some variation of this method, which is similar to the Japanese art of mokume gane. Your Damascus steel wedding ring from Titanium-Buzz will be 100 percent one-of-a-kind. In fact, no two are exactly alike. That's because Damascus steel mens wedding bands are made from two types of stainless steel that are pattern-welded at high temperatures and then machine-hammered for a totally unique aesthetic. Each Damascus steel wedding band in our selection is replicated using a time-honored method until it's left with a solid billet. The rings are cut from the billet at different angles to reveal the rippling, wave-like pattern in the metal. The result? A totally rare and unique Damascus mens wedding band that belongs only to you. 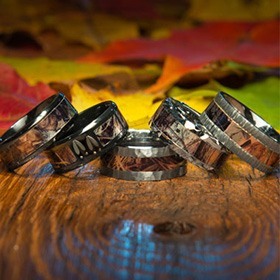 To say "I do" in style, order a Damascus mens wedding band today that matches your unique personality. Damascus steel wedding bands are available in several styles and colors with various inlays, accents, finishes, and more. Choose your favorite Damascus steel wedding ring and take advantage of Titanium-Buzz's low prices and fast shipping. We always offer free shipping on U.S. orders. Is Damascus steel really as strong as some people say it is? Although prized for its distinctive, almost hypnotic patterns, Damascus steel was used to create much more than pretty serving ware and ornamental weapons. Damascus steel swords and knives are legendary for their sharpness and balance, to the point where incredible tales of their power became some of Damascus steel's best-known characteristics: Swords that were impossible to break, knives that were so sharp they could splice a human hair, blades that would never lose their edge, armor that could stop any bullet, guns that would never misfire -- all became part of the Damascus steel mythos. While most of the stories are exaggerated, and some of the things Damascus steel can purportedly do are literally impossible, there is still something magical about this ancient art that continues to inspire the imagination today. It's no surprise, for instance, that Damascus steel was the inspiration behind Valyrian steel, a fictional metal from a certain TV show you may have heard of. While you won't be taking down any White Walkers with your Damascus steel sword anytime soon, scientific analysis of ancient pieces of Damascus steel has revealed the presence of carbon nanotubes in its molecular structure, which could account for its incredible strength and durability. Damascus steel rings are available in a wide range of sizes, but because the metals used to make the rings are so hard, resizing a ring may prove to be impossible. To help accommodate a wider variety of customers, 1/4 sizes are available upon request. Damascus Stell Rings may be customized by adding up to 30 characters of your own text to the inside of the band for no additional charge. Enhance the beauty of your one-of-a-kind Damascus ring by adding a special date to the band, initials, or a name. 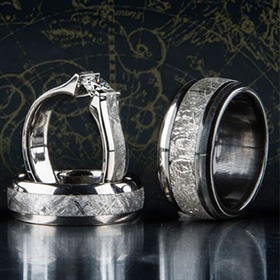 All of our Damascus steel wedding rings are made in the U.S. for superior quality. What is an acid finish? After we build each ring, many of our styles are dipped in a diluted acid bath. Why would we do this? Because it darkens the patterning and reveals the different reflectivity levels of the steels used to create the ring. Some patterns look like water, some look like wood grain, and others take on more mind-bending looks like zebra patterns or tiger stripes. We can even use acid finishes to bring out some cool straight-line effects that definitely set these rings apart from historical relics. Please note: In many of the pictures of acid-etched rings on our website, the metal looks darker -- almost black -- than it actually is. In reality, acid-etched Damascus rings tend to be more of a flat, dark gray offset by lighter areas. How do I clean my Damascus steel ring? Damascus steel may be the world's most mysterious metal, but there's nothing mysterious about how to keep it clean: Soap and water. Just like washing your hands. Keep in mind that even though Damascus steel may be the stuff of legends, it can eventually show wear. If this ever happens to you, we can handle it -- send your ring back to us, and we will refinish it for you. Is a Damascus steel ring right for me? Damascus rings are almost more of a calling than a style. They aren't right for everyone, but for those who feel their allure, the pull of the metal is irresistible. Nothing else looks like them, nothing else feels like them, and nothing else you will ever wear will have such a rich and complex history. Want to hear more about the secret of this lost art? Want to talk about personalized designs or additional custom options? Call us at 1-866-215-1861 or send us an email. We'd love to hear from you. 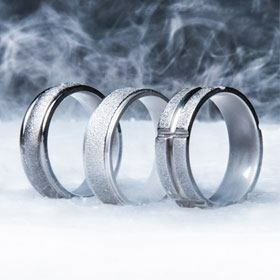 Experience the great choice of men’s wedding rings created with inspiration.